More than 100 people gathered to pay their respects to talented cyclist Joel Hawkins, the young rider tragically killed in June 2015. More than one hundred Victorians were called to action in the name of road safety on Saturday, with The White Bike Foundation and Mornington Cycling Club hosting the third annual memorial ride for aspiring young athlete Joel Hawkins. 17yo Hawkins was on a training ride, and just 7km from home, when he fell victim to dangerous driving on June 17 2015. 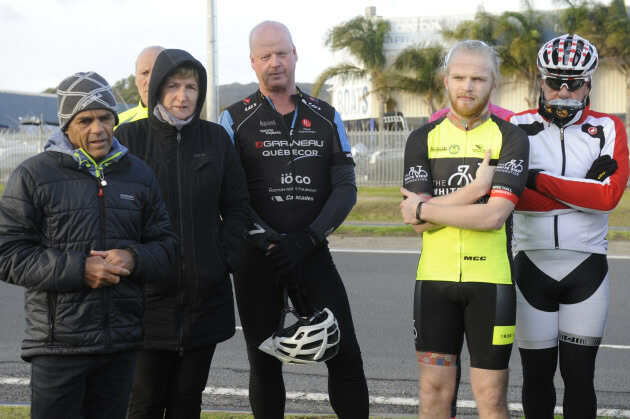 The annual ride of remembrance took place just days after five motorists died on Victorian roads, including a 61-year-old cyclist hit by a garbage truck just 16 kilometres from the site of Hawkins’ death - and almost three years to the day. At the memorial White Bike Foundation director Chris Savage urged media to stop promoting a 'war between cyclists and drivers' and payed tribute to those affected by the recent run of crashes and road fatalities. “We launched the Foundation in March 2018 to educate and protect all road sharers, in an effort to prevent tragic incidents – like these – occurring on Australian roads,” he said. The Foundation’s first ambassador, Robbie Peime, returned from his maiden Ironman triathlon in Cairns to join Saturday’s ride on a handcycle. The parents of Jason Lowndes, Graeme and Trudi travelled from Bendigo to pay their respects and participate in the Hawkins memorial ride. Jason was killed on a training ride just outside of Bendigo last December. Savage placed a small white bike at the site of Hawkins’ and Lowndes’ death – along with two more to remember Scott Peoples and Mike Hall – during the 1,700-kilometre ride from Mornington to Canberra to launch the Foundation in March. Mourners including Les Hawkins and Trudi and Graeme Lowndes gathered at the tribute on Saturday. Image: Supplied. Leslie Hawkins, father of Joel, said accepting the loss of Joel doesn’t get any easier with time. A ghost bike was erected in Joel’s memory near the corner of Country Club Drive and the Nepean Highway after the driver of a car failed to give way on Nepean Highway at its intersection with Ponderosa Place, Dromana, on 17 June 2015. Mornington Cycling Club (MCC) President, Bruce Trew said Joel was a fantastic lad, well-respected and extremely talented. Joel was 17 years old and pursuing a dream when his journey was cut short. He was a Year 11 student at Dromana Secondary College. Among a long list of achievements, Joel won bronze for Victoria in the 2014 Cycling Australia U17 National Individual Time Trial Championships (aged 16). who passed away as a result of a road incident. After launching its road safety awareness campaign on 17 March 2018, The White Bike Foundation delivered this message to Greg Hunt MP in Parliament House: There are 86,400 seconds in one day. Pause and take two to make the safest decision for all road users - hence their #think2 hashtag. A cyclist, motorcyclist, pedestrian and two drivers were killed over the four days, with three deaths occurring within two hours of one another on Monday 11 June 2018. The death of a 70-year-old woman in a driveway on Saturday 9 June when she was struck by a car in Parkdale just before 10am. A 52-year-old man killed in Stawell on Sunday 10 June, when his car rolled and struck a tree just before 7.30pm. A 61-year-old male cyclist in Moorooduc, on Monday 11 June following a collision with a garbage truck about 10.40am. A motorcyclist, aged in his 50s, who was killed on Monday when he collided with a car at Heathcote about 11.15am. The death of a 28-year-old man when his 4WD rolled backward on a steep incline striking him while off-road, in Hopetoun Park about midday on Monday. For more on the good work of the Foundation, or to support them in any way, visit www.whitebikefoundation.org.au for further details.